When my wife and I started dating, we weren’t thinking about how our relationship was part of a growing trend that is currently changing the cultural landscape of America. We didn’t think about how as early as our parent’s generation, a union like ours would have been punishable by exile from friends and family, imprisonment, or even death. We just knew we were in love. We didn’t really consider these implications… that is, until we had our son. Before this, our lives were our own and we couldn’t care less about feelings and perceptions of others that disapproved. She didn’t care that I was an African- American who grew up in the inner city and I didn’t care that she was a Caucasian country girl from Maine. We were confident enough as individuals to see beyond color and culture. But now things are different. We brought a new life into this world. A world, while still evolving, unfortunately consists of people who will disapprove of who he is. 1. Identity- People (like myself) born from parents of one race tend to take their identity for granted. My skin color is just the same as my parents and most family members. From an early age, my “identity” was no mystery to me. However, if you are interracial, with your mom looking one way and your dad another, your identity can be confusing, especially at a young age. 2. Lack of Exposure- It is quite common for an interracial child to be immersed in one culture more so than the other. This can be due to growing up in a single-parent household, or to growing up in a neighborhood where a particular race is the majority. 3. Isolation – Children are naturally curious and unwittingly cruel. If you are a child in a school where you look or act different from the mainstream, you will likely be a target. This concept is no exception when you are an interracial kid in a class room full of other kids that look different from you. With that being said, In addition to our regular duties as parents, my wife and I have another very important responsibility: To find fun and interesting ways to teach him about his different heritages, and instill within him a confidence of self. The idea is that love and acceptance from his parents and family will be enough to combat any negativity that he may face in this world. Here are some of the things that we have done or are doing so far to prepare him. I mentioned earlier that I grew up in an inner-city area of New Jersey. The community that I was a part of was essentially a melting pot of cultures, religions and ideals. In elementary school, I remember doing book report with a kid Pakistan, bartering lunch with a boy from he Philippines, playing Mortal Kombat with my best friend from Guyana and playing baseball with my neighborhood kids from across the street that happened to be from Puerto Rico. I truly believe that being exposed to these different experiences at an early age taught me to judge people by their character and not by their skin color. I want that upbringing for my son as well, which is part of the reason I chose the area that we currently live in. Not only will he learn the valuable lessons that I did growing up, the chances of this being ostracized will be drastically decreased in a in a multicultural setting. Shades of Black- Primarily a picture book, Shades of Black is a celebration of the many colors that make up the African- American race. The pictures consist of children with a variety of skin tones that range from light to dark and proves how beautiful they all are. 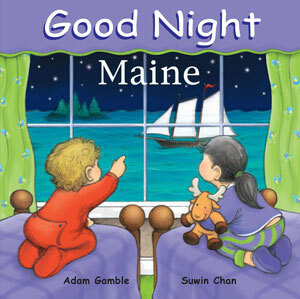 GoodNight Maine- This also a picture book. However the images of both coastal and inland Maine are so strong, not many words are needed. We visit my wife's family in Main often, so it is cool to connect the images that we see in the book with what we actually see while we are there. An excellent bedtime read. 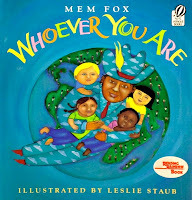 WhoeverYou Are - This is a book that I believe should be in every child’s library. The book has pictures children from all over the world and stresses the point that no matter where you come from, we are all have the same wants, needs and cry the same tears. 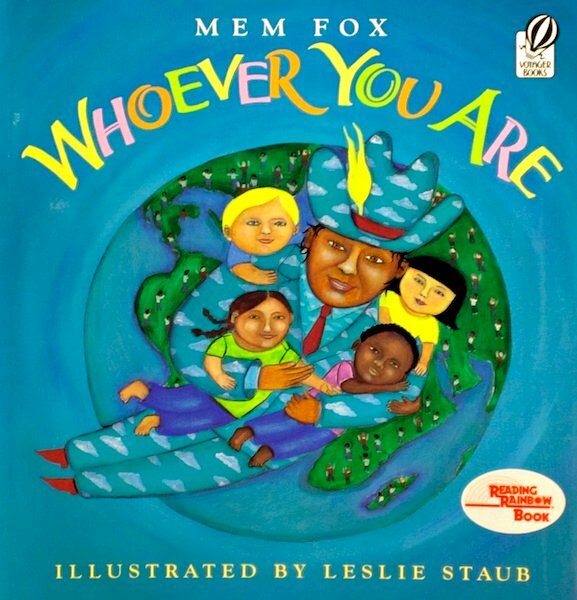 The illustrations are beautiful and the lessons taught in this book will reverberate well into adulthood. My wife and I were lucky in the sense that our parents were very supportive towards our relationship. I have heard horror stories where people were forced to choose between their families or the person that they loved. Partly because of this, we make it a point to get out and visit them as much as possible. Our son gets to see firsthand how well people of different backgrounds can get along. Also, by visiting both families frequently, he gets to experience the different cultures. This way, he is familiar with both aspects of his identity, which I hope will develop his confidence as he gets older. While race relations in our country have steadily improved over the years, they are by no stretch of the imagination perfect. There are still people in this world who will say and do things in order to make our son feel as though he does not belong. While we can’t protect him from everything, what we can do is our best to prepare him for what he may encounter. Question: What's your take on interracial marriages and the challanges they and their children face? Can you relate (directly or indirectly) to these issues?